​Atomica is delighted to announce the release of two brand new exclusive limited edition prints just in time for present season! 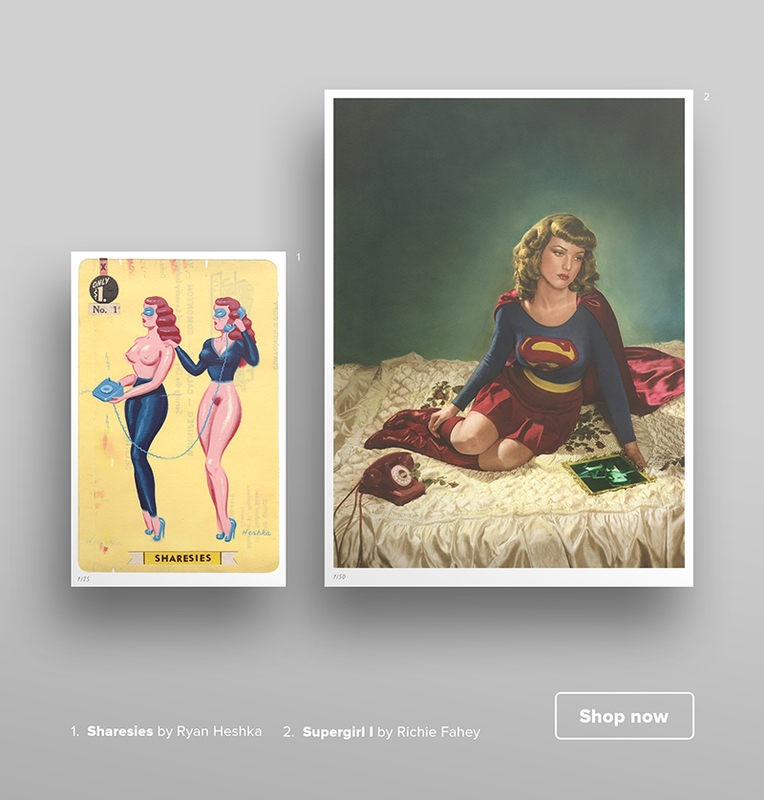 ‘Supergirl I’ by Richie Fahey and ‘Sharesies’ by Ryan Heshka – two striking, quintessential images that sum up everything we love about these two incredible artists. 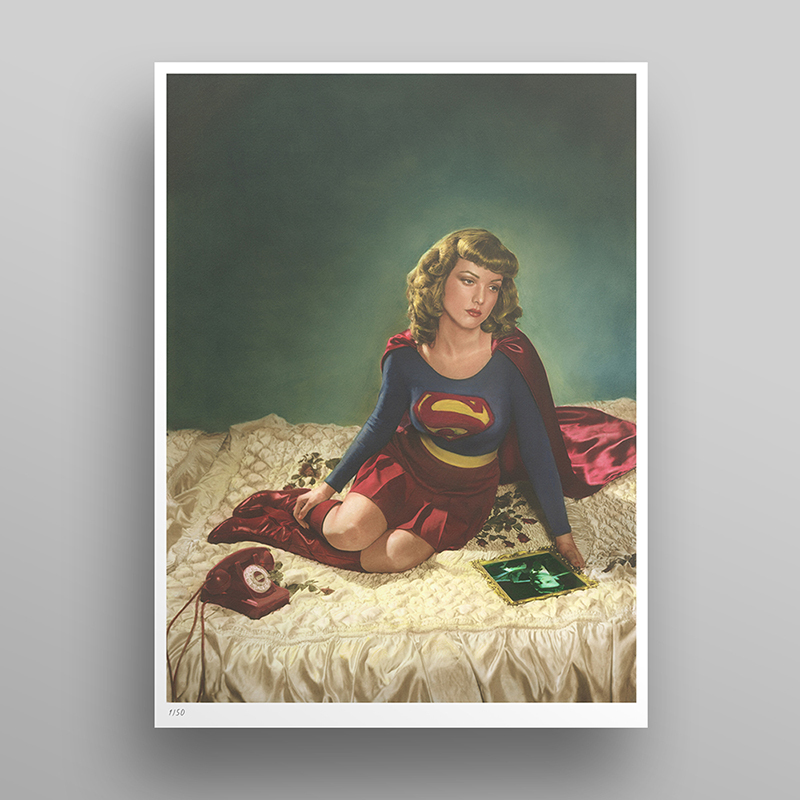 Both are total must-have prints for fans, collectors and comic & art lovers alike. certificate of authenticity from artist Richie Fahey. New York photographer and painter Richie Fahey is an icon of the Lowbrow world. Taking inspiration from old movie houses and pulp paperbacks, Fahey creates black and white photographs using vintage lighting techniques, meticulous art direction and personally sourced props and costumes, before painting on his prints with coloured oils. This unique process results in images that feel authentically vintage and full of old-time glamour. Like all of Fahey’s work, there is an intriguing narrative taking place in ‘Supergirl I’; the heroine sits pensively on her bed with a mysterious ‘man from Krypton’ in the photograph next to her. Revealing a new side to the comic book hero, this work has become one of Fahey’s most iconic pieces. The original artwork dates back to 1999 when Fahey shot the image to be used as an album cover and has surprisingly never before been released as a print edition. Until now! Fahey has exhibited his work worldwide and in 2002 was commissioned by Penguin Books to create the cover artwork for their reprint of the James Bond series by Ian Fleming. Signed and numbered limited edition giclée print. Canadian artist and illustrator Ryan Heshka is a self-confessed pop-culture junkie influenced by everything from pin-up girls to antiquated comics and b-movies, frequently depicting witty characters and scenes from an imagined canon of 1950’s pulp sci-fi art. One of the most exciting artists to emerge from the recent north-American new-contemporary scene, Heshka primarily works in acrylic paint on wood panel and vintage paper, frequently embellishing with cuttings from pulp magazines. Heshka has exhibited extensively across Europe and North America including at Roq la Rue in Seattle and Jonathan Levine Gallery in New York. His latest comic book ‘Mean Girls Club’ was recently released by UK publishers Nobrow. Please email us on hello@atomicagallery.com for any further info or questions.